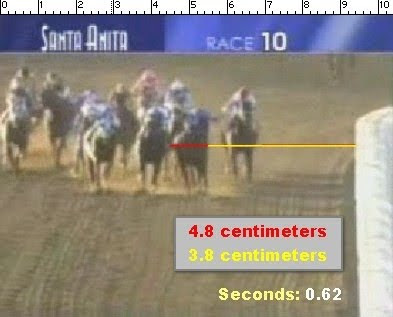 I must admit, I didn’t watch or wager on the Santa Anita Handicap at Santa Anita Park on Saturday and, in retrospect, I’m glad I didn’t, as my knowledge of rugby is quite limited. To say that the stretch run of the Big ‘Cap was a bit rough is akin to noting that Charlie Sheen is a little out there — an understatement of the highest order. 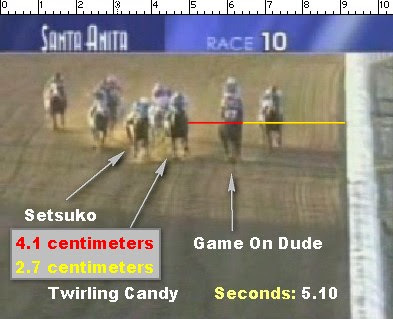 For the record, Game On Dude won a three-horse scrum with the eventual second-place finisher Setsuko and 1-2 race favorite Twirling Candy, who faded out of contention after getting bounced around like a rent check from Lindsay Lohan. 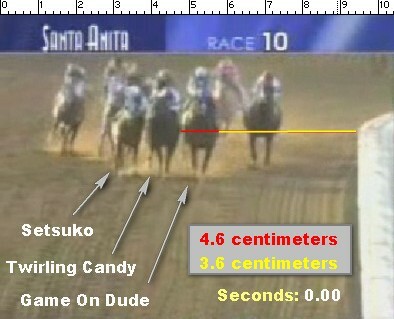 According to Scott Chaney, one of the Santa Anita stewards who by a 2-1 vote elected not to alter the order of finish, “Candy” caused his own problems. 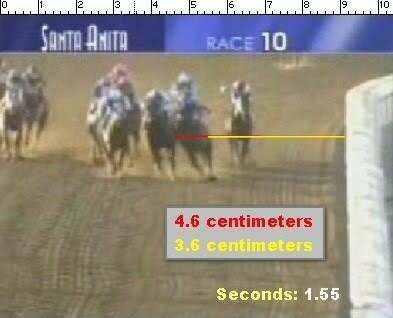 It’s interesting to note that by measuring Game On Dude’s distance from the rail in each of the six still shots posted above (all captured within 5.1 seconds of the first frame), it is clear that the stewards were wrong: the “Dude” did, in fact, drift out. 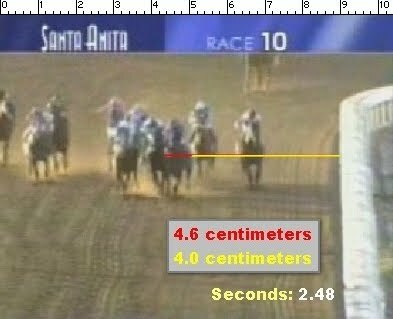 Even worse, there were times (see shots two, three and five) that the Bob Baffert trainee looked more like the Leaning Tower of Pisa than a thoroughbred racehorse — which jibes with what Joel Rosario, rider of Twirling Candy, observed. Not surprisingly, Chantal Sutherland, the first female rider to triumph in the Big ‘Cap in its 74-year history, disagreed with her riding peers and instead sided with the stewards. Amidst all the controversy, one thing is clear: I sure as heck wouldn’t trust Sutherland to shoot an apple off my head with a bow and arrow. 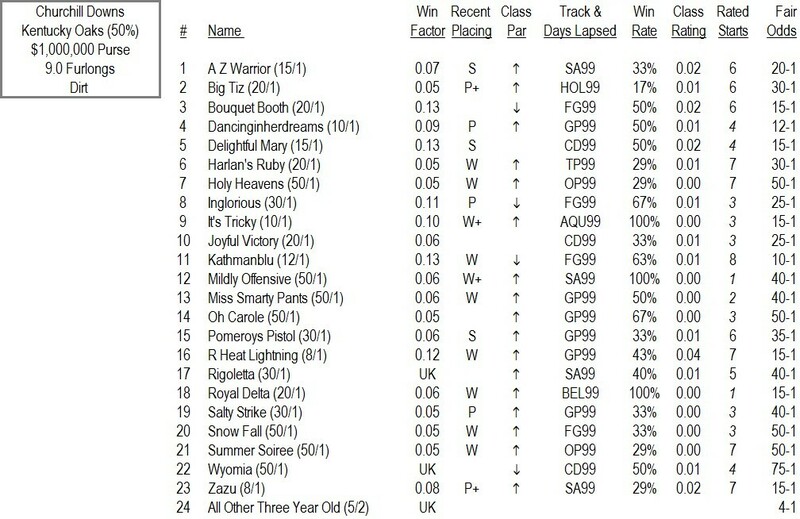 When leading Kentucky Derby contender Dialed In faced just four rivals in a $62,500 optional claiming event at Gulfstream Park on Sunday, the expectation — at least by those that made the colt the 1-5 betting choice — was that he would win for fun. 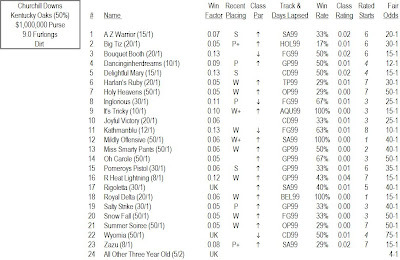 After all, the son of Mineshaft was the only graded stakes winner in the field — a potential super horse, according to some. 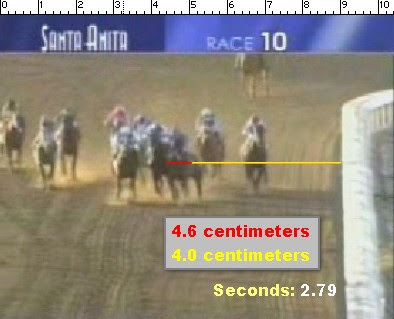 Yet, something strange happened on the way to the winner’s circle that day: mainly, Dialed In got beaten. 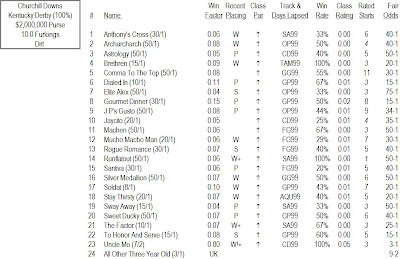 Equestrio, a four-year-old that had just finished fourth, beaten six lengths in a similar spot, held off his vaunted stable mate by a half-length, despite drifting out and being taken in hand in the closing stages. The final time for the nine-furlong affair was 1:51.12… not exactly the kind of clocking that inspires tears of joy and flowery prose. Still, Dialed In fans need not fret. 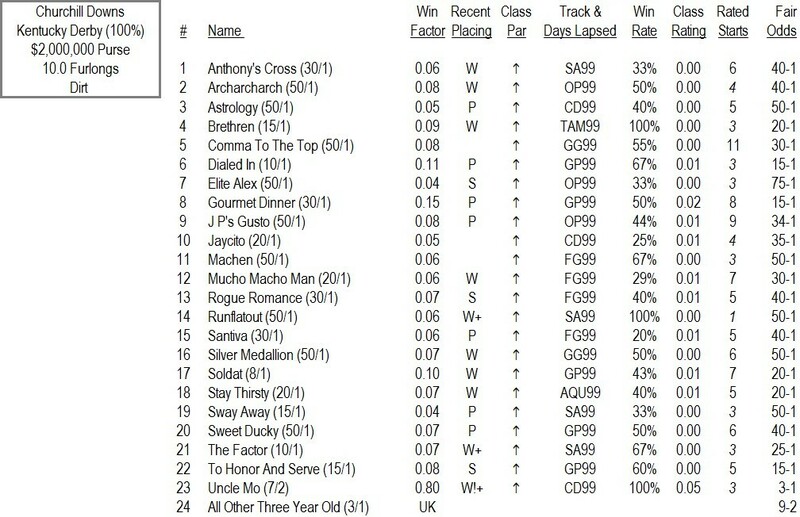 While I think Sunday’s contest showed that the youngster is not yet the sport’s greatest star, nor even the best three-year-old in training (that honor still belongs to Uncle Mo), as a prep, it served its purpose and Dialed In should be ready to give his best in the Florida Derby.